What are Custom PS3 Controllers? Playing video games has always been one of the top activities for youth and adults to participate in on a daily basis. Imagine having the ability to play your favourite games on your console and to have your own personalised PS3 controller to play with. Custom PS3 controllers have become increasingly popular as they help to turn a generic factory-made controller into something that you can be proud of and show off to your friends. Custom PS3 controllers are able to look their best with the help of personalised skins. Skins are essentially stickers that you will apply to the exterior of your controller to make it look a certain way. Whether you are interested in buying stock skins (generally in any colour of your choosing) or speciality skins that you can design on your own, the options are endless. Many gamers also find it beneficial to add their PSN ID’s to the skin to help give it a more personal touch. For gamers who are looking to delve deeper into the customization process, there are a variety of ways that you can customise your toggle sticks and your D-pad buttons to change the look of your controller. With the ability to add chrome sticks or even gold D-pad buttons, your controller won’t even resemble a traditional PS3 controller anymore. You can also consider changing your toggle sticks and D-pad buttons to a colour or design that matches the skin that you purchased. 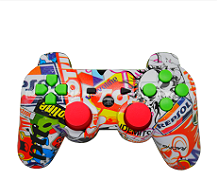 If you don’t have a specific budget and are concerned about the quality of personalised skins, consider purchasing a PS3 controller that is newly designed to fit your personal specifications. There are a variety of manufacturers that create PS3 controllers in any colour and style that you see fit, essentially allowing you to have a 100% brand new and custom controller. This can be the best option if you’re willing to spend a little more money as it will allow you to use a new controller rather than the one that came stock with your Playstation. Plus, it would be great to show off to your friends and help them to find their own custom colour controller. With the ability to customise your PS3 controller, gaming can be a much better experience. Not only will it look awesome next to your Playstation, but it will give you something to be proud of every time that you play.